One morning my husband and I made scrambled eggs. It was more like I was cooking them after he scrambled them. He is an excellent scrambler. When he is finished scrambling the eggs they always look almost artificial to me. They are shockingly uniform in color. Whenever I scramble them there are usually bits of white here and there which does not bother me much. After I cooked them and plated them we noticed that there were small black bits in the eggs. Neither one of us had put pepper in the eggs. It made me go back to the pan that we used. Sure enough, the Teflon (Polytetrafluoroethylene (PTFE)) coating on the pan was beginning to come off and went into our eggs! I know that the coating is supposed to be non-toxic (unless you are Avian!). I am not a bird, but even so I decided to go back to my cast iron pans. My mom gave me all of her cast iron pans probably 10 years ago. She has arthritis pretty bad and they can be heavy especially armed with food. 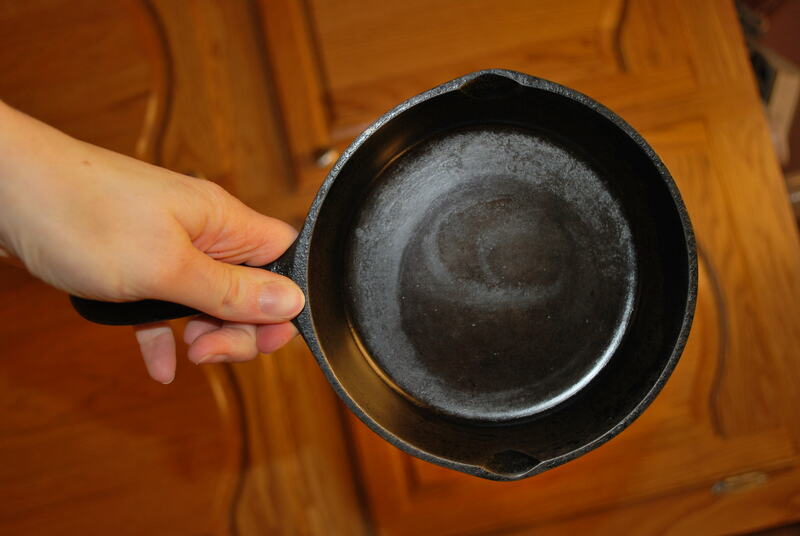 I used my cast iron pans quite a bit, but I still would use my Teflon coated ones the majority of the time. They come in all shapes and sizes! 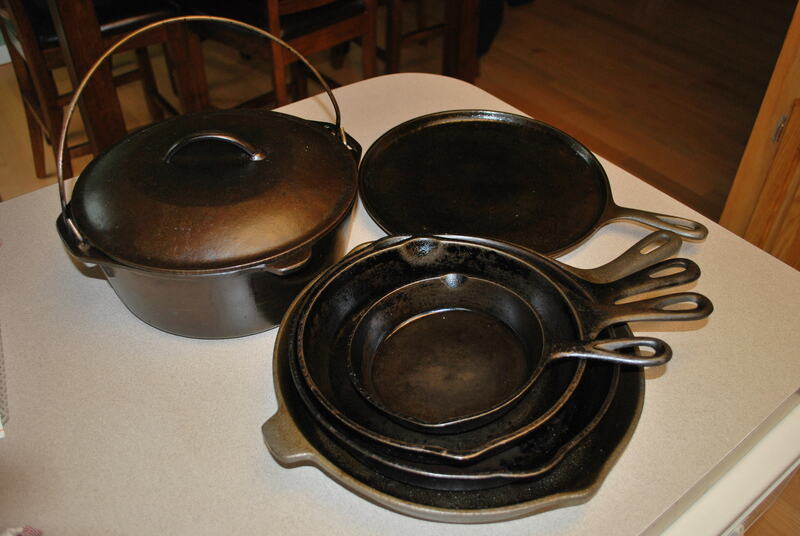 Here is a sampling of the pans I have. My favorite one is this little guy. My mom would always make my breakfast in it before I went to school, whether it was eggs, little pancakes, or French toast! Avoid using soap-clean with water only when possible. Sometimes kosher salt on a damp cloth is enough. Clean the pan immediately after cooking. Remove the food and wash the pan! It makes cleaning easier. When clean, I like to heat it up on the stove top and wipe it out with shortening. Once it all melts on the pan you can shut off the heat and wipe out the excess. That’s pretty much it! 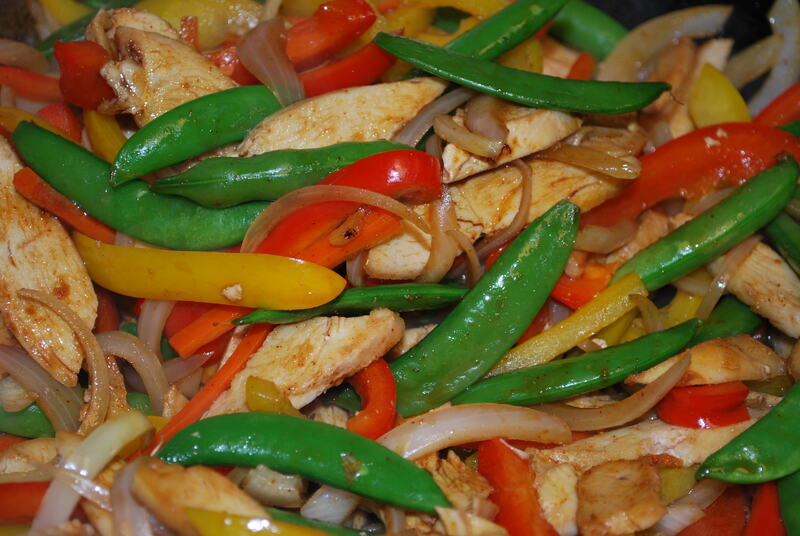 One bonus to the pans is that they can add small amounts of iron to your food. Many people could benefit from that. I’ll take a bit of that instead of Teflon any day! In the background of the small cast iron pan you could see my cupboards. We have been in our house for 12 years (in August) and things now need to be updated and replaced. 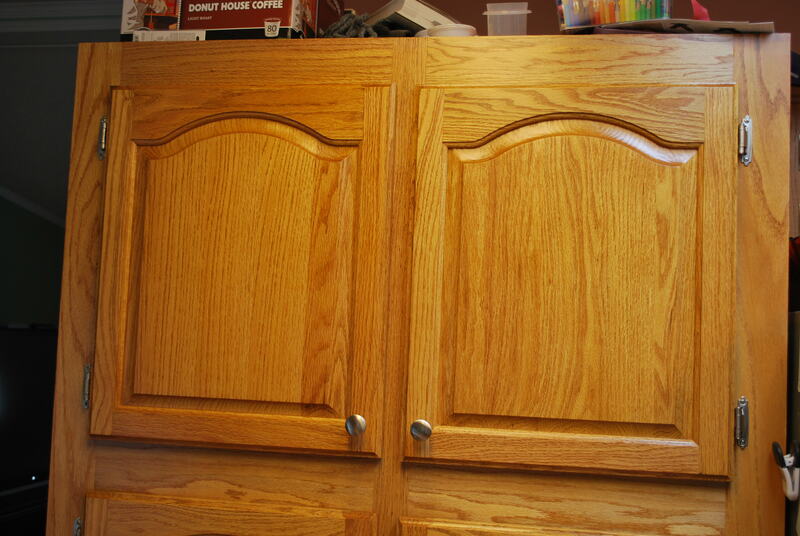 The cupboards are oak and they look(ed) a bit worn. Not warped or anything, it’s just the finish that has worn off. Another thing that bothered me was that they were trimmed with fake wood. My husband was willing to purchase new ones, but I just felt bad for the oak. It bothered me when I thought of ripping them out and just throwing them away. So, I decided to tackle re-finishing them. I have been working on it for about a month here and there. I choose one area, remove the doors and hardware, and begin the task of stripping the old varnish off, sanding, and painting on new polyurethane. I complete one area and then move on to the next. This is nice because my kitchen does not feel completely torn apart, and I get to see the effort that I am putting in is worth it. 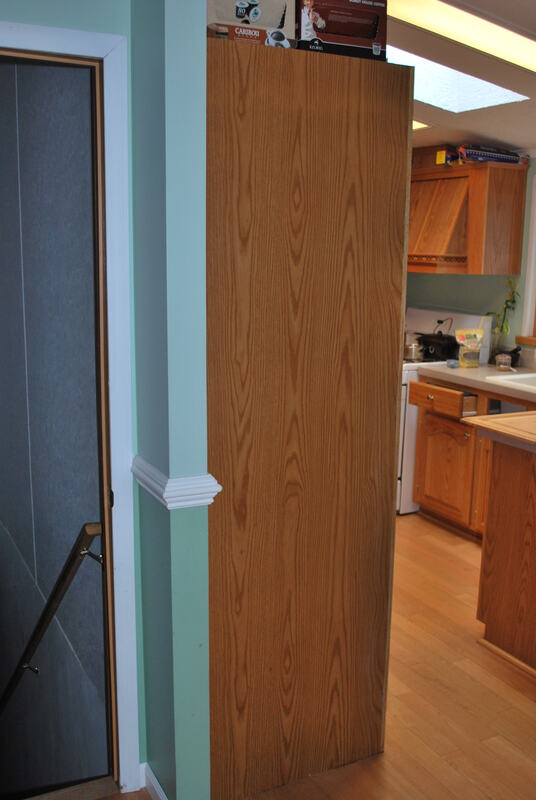 I have found new oak veneer that I can trim them out with, which gives me the solid oak look I always wanted and now I am getting the new finish I needed! 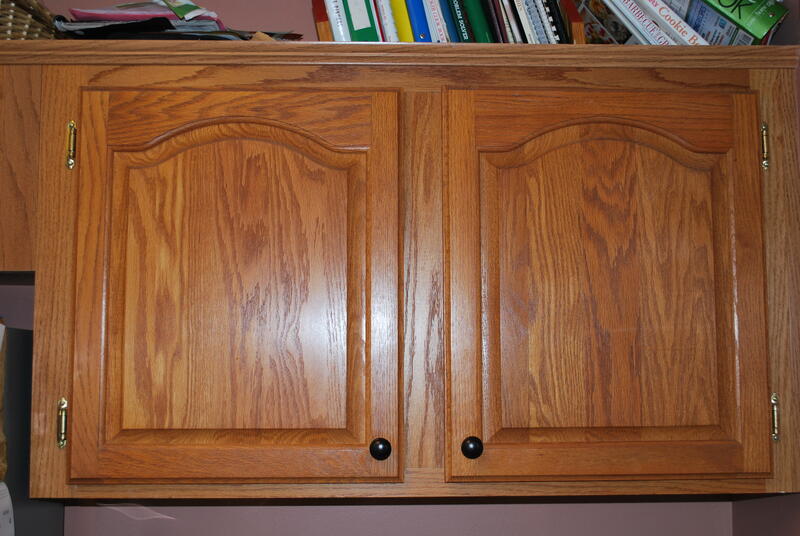 You can see the sides of the cabinets are in fake wood which is what I did not like. I did buy new hardware which is slightly annoying because the new hinges look identical to the old (but are stainless steel not shiny gold of the old ones) but are just a bit off so that I need to fill the old holes with glue and toothpicks and drill new ones! Here are some cookies my daughter and I made (decorations don’t stick too well to chocolate chip cookies. :)). 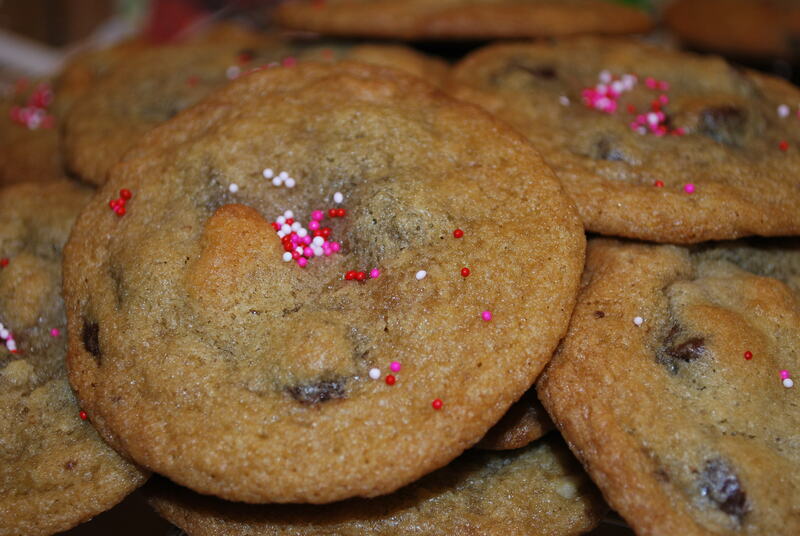 We made them with dark chocolate chips. I wanted to make cookies or a cake or something for Valentines Day, and thought I should wait to make them but the chocolate chips kept calling to me so I gave in. It was a super cold and snowy day today so baking was almost a requirement anyway! We will just have to make something else for Valentines Day too! We used the good old Toll House recipe (shh don’t tell, we used Ghirardelli chips!). I was inspired to make the cookies by a blogger named Alexandra. She made them using the new Toll House dark chocolate recipe which I checked out and it’s the same as the old original one, it just uses ¼ cup less chocolate chips! Go figure! So I did leave out the extra ¼ cup. My husband did not care for the dark chocolate in them, but he is not exactly a dark chocolate fan. My daughter thought they were fantastic! She is a dark chocolate lover like me. This was sort of a test of my intuitive eating skills. I said it was a good day for baking, and it was, but I also wanted to put my newly found skills to work. Normally when making cookies, I would eat half the dough, eat 5 cookies after they came out, say what the heck and move on to ice cream! The act of baking always felt like a trigger to me. Today I made them after I had dinner and was full. So, I knew I was not vulnerable (ravenous) and did not think it would set me off. I still have not had any cookies or dough yet. I am just not feeling like it. I am still full from dinner and it’s not appealing. I know they will be there when I want them and they will be great! I think most of my binge eating problem was never having enough good food in me to feel satisfied, and then I would taste something like cookie dough and my body would make up for it. 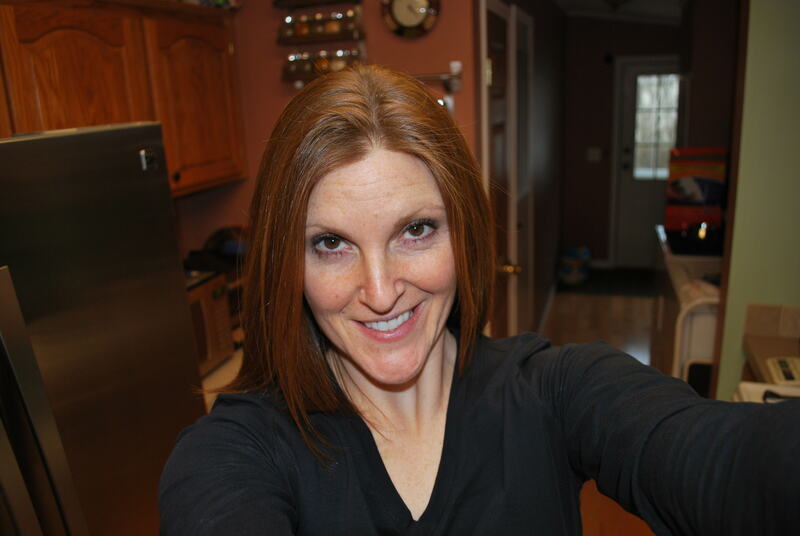 I really feel like I am on a roll with intuitive eating! That’s enough of my intuitive eating talk for a while. It may get old to you but it’s pretty amazing to me that it is working! Have a great night! I will talk to you soon! A rave, a rant, and of course food! It’s been a while since I have written. As you know I have been working on intuitive eating. I read a book about it back in July of 2011 and it spoke to me. I have been working on it ever since. I had many times since reading it where I felt out of control and thought it was not working. I had to go back and re-read the book (which I checked out from my local library) and it helped. Before reading this book, I always thought there was something wrong with me. I could not understand why I ate the way I did. It was all or nothing with me. My husband did not think I had anything wrong with me. He said I have been like that ever since he has known me. He always thought that since I maintained a healthy weight I was ok. For someone who has never gone through it, it’s hard to understand. Each time I had a binge episode it was due to being restrictive in some way: Keeping my calories to a certain number, eliminating food groups/types (gluten, sugar, etc), signing up for food/health challenges. Sometimes I would have a trigger and just not care. I would give in knowing exactly what I was getting into and doing. I have totally given in to the intuitive eating idea. I can see how it takes time. Little by little I have allowed myself to. First I dropped my food checklists, I stopped measuring food so much, and I have stopped weighing myself often (several times a day). I have been weighing myself about 2 times a month. This has been the biggest thing for me. I did not think I would be able to give up this one. My weight has pretty much held steady for about 6 months (I fluctuated a bit with the holidays and my thyroid dropping, but have come back to normal with normal eating not restricting). It’s nice not seeing the fluctuations from day to day when you don’t weigh yourself often and wondering what is causing it (even though I know it is normal to fluctuate due to water retention, glycogen stores etc.) I don’t use the numbers on the scale to celebrate a weight loss or send me into a calorie restricting mode from a higher number. I am able to listen to my body and give it what it wants. I am feeling balanced with my food. Now exercise. I have had problems in the past with my IT band causing pain in my knee. As a result, my running was put on hold. It allowed me to try other activities and forms of exercise. As my knee got better I started to run more often (three days a week) and doing Tabata/circuit (three days a week) workouts. I was doing what exercises I liked the best. I even took it a step further and recently tried training for a marathon. Not the best idea for me, but I was so excited about it. I got through two weeks and my knee is now mad at me once more. During those two weeks I felt mentally awesome, but I should have been listening to my physical body. So with food I think I have found balance (In the past even claiming that has sent me on a binge, but it feels different now, I’ll be ok. J) but now I need to get it with my exercise. I am taking it easy this week. Lot’s of stretching, icing, ibuprofen, and some strength training. No running for now, maybe next week. This recent strain on my knee opened me up to listening to my body in other ways. Over the past few days, I have left my exercise feeling better than when I started (my IT band was very tight when I started the workout and loose after), not overly exerted and having an extra sore knee which sometimes I am guilty of. Just because I am not working out as vigorously this week does not mean I will gain weight. It just means I will eat less. I am learning that the body is brilliant and you can trust it. I also have been feeling very angry about commercialism. Someone always wants to sell you something. Everywhere I go! I can’t even pump gas anymore without a TV on the pump telling me I need to buy something! I paid cash for something at a store and had to answer several questions on the debit/credit keypad related to my shopping experience and my potential to refer someone to the store! It’s too much! There were times recently when I felt like I could really use the advice of a professional in the area of intuitive eating. I looked into various areas of it and decided I did not have an extra $200.00 for a 45 minute session or money to spend on the other options. If you have some great information, and you know how to help someone, should it cost that much? I am not judging, it just left me feeling very disappointed that I could get help if I spent a bunch of money and realized that I was the one that could help myself with advice from the book which I checked out for free and read. So I am sharing my story in hopes that it helps someone else. I found out about intuitive eating on another persons blog and it has helped me tremendously. I am not a doctor, a dietitian, or a psychologist/therapist, but this is what has worked for me. If you need to seek the help of a professional, please do. For me it was more of making my self do the work suggested in the book little by little. It’s been a long road for me and I feel so much better and I know I will continue to. Editors Note: I wrote this last week. I did make it through the Super Bowl and ate normally. I also got a phone call this morning from my endocrinologist saying that my thyroid is still too low. They increased the dose of my medication. This is good because I have been feeling lazy and cold again. Now I know there is a reason for it! J I also have recovered from my marathon attempt. My knee IT band is tight again but not with the pain that I had last week. 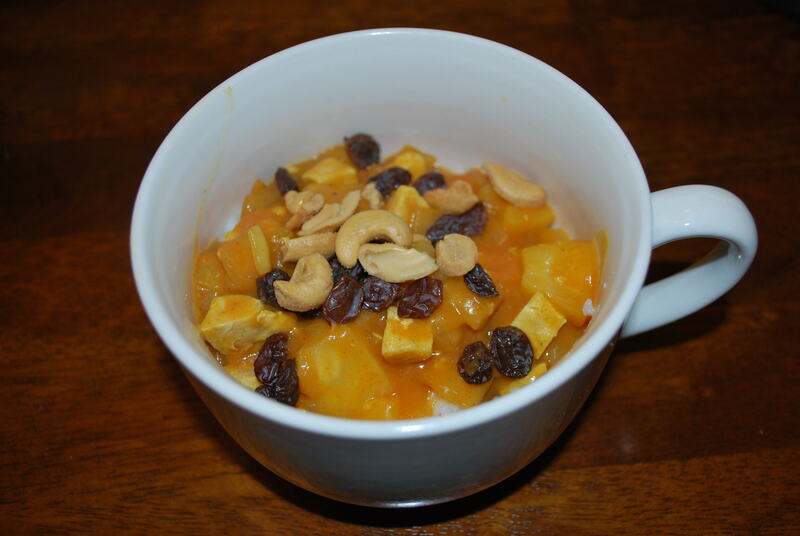 Here are some of the dishes/items I have been eating lately. You can see a wide range of foods from meatless meals to meaty hamburgers. The important thing for me is to eat when I am truly hungry and to stop when I am full. It sounds very simple for some, but for others it’s a bit more complicated. 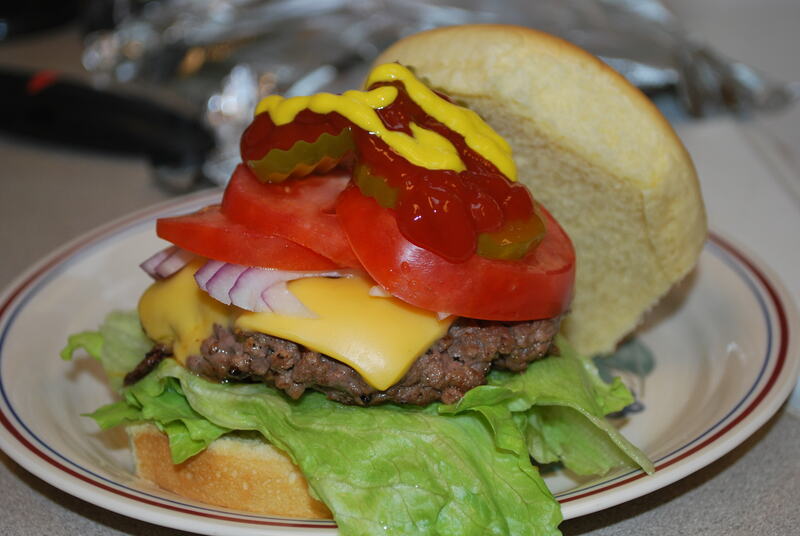 Sometimes you just need a burger! 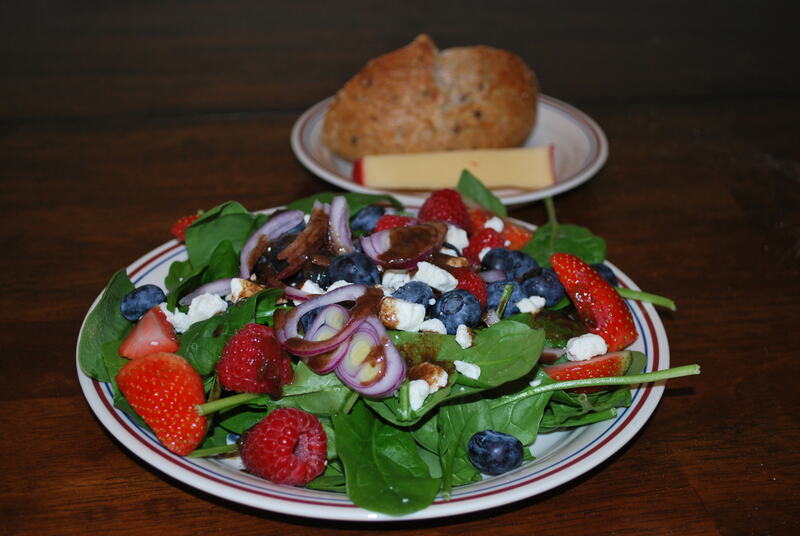 A salad with spinach, berries, feta, and balsalmic vinagrette. 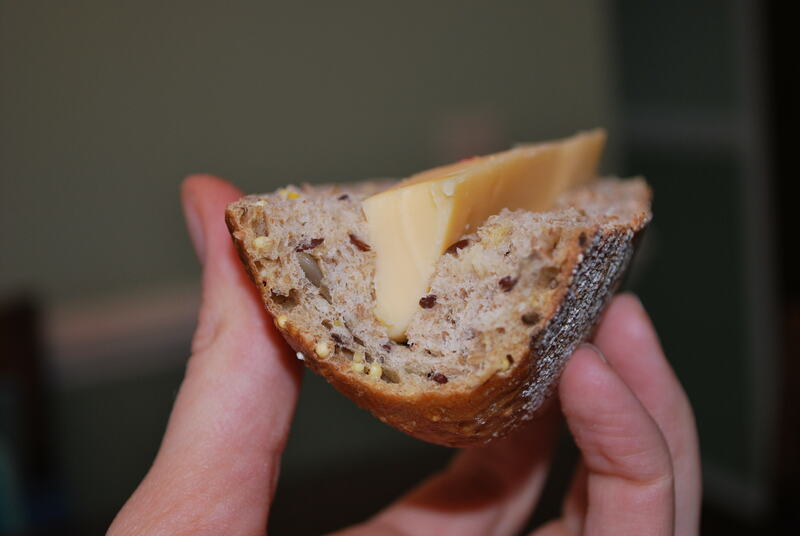 Multi-grain bread stuffed with Gouda cheese. A new obsession of mine! 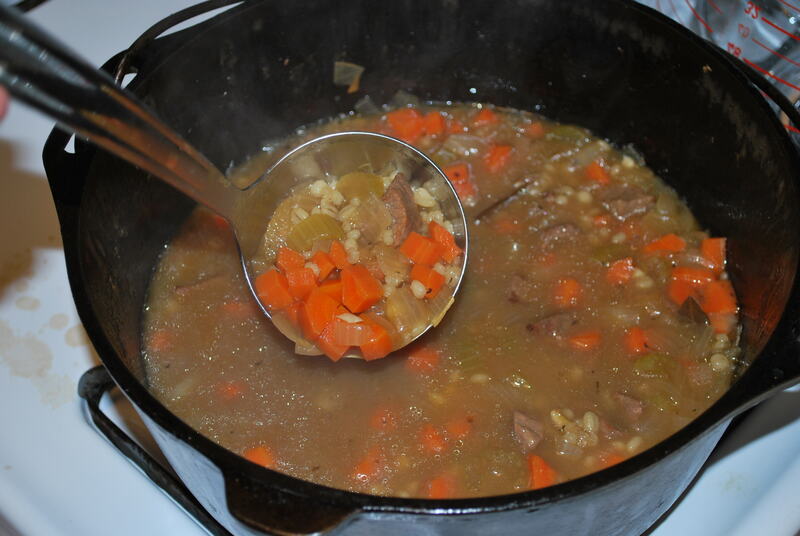 Hearty beef and barley soup. 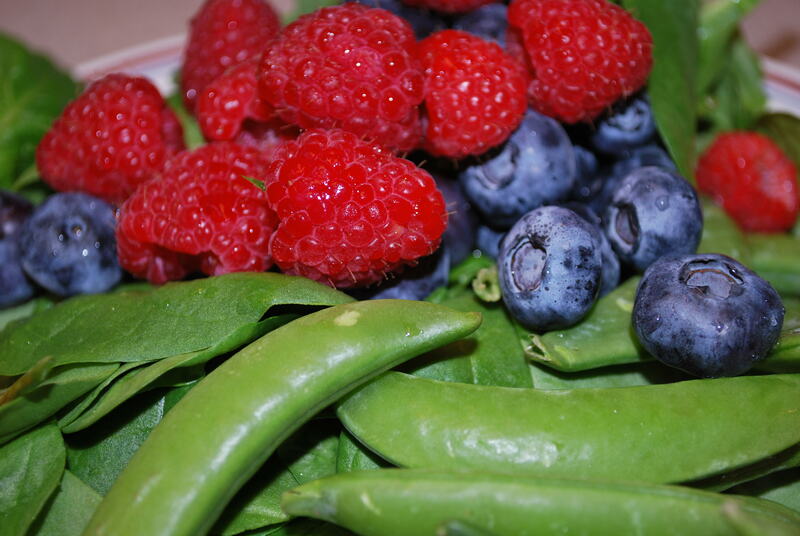 Veggie and berry platter. So good and colorful! Chicken curry on white rice. What a nice change up for me! That’s all for now. Have a great night and I will talk to you soon!